Tanzania is one of the most beautiful countries in the continent of Africa. With attractions like the Serengeti and Ngorongoro, Mt. Kilimanjaro , the Selous and the Spice Islands of Zanzibar and Pemba , it is difficult to refute such a claim! World famous for its spectacular wildlife, visitors from around the world dream of one day experiencing its treasures. Whilst the enormous migrations of wildebeest and zebra across the Serengeti Plains are the most well known attraction in the north, the superb Selous Game Reserve and Ruaha National Park in the central and southern sections of Tanzania are less known, yet are some of the most magnificent wildlife sanctuaries in Africa. Mount Meru and Mount Kilimanjaro, which is the highest mountain in Africa, are also very popular destinations with Dar-es-Salaam the hub visitors travelling to the exotic island of Zanzibar . The Mahale Mountains and Gombe Stream NP on the shores of Lake Tanganyika are home to chimpanzees and the lake is probably the least exploited and developed of Africa 's major lakes. "Serengeti" comes from a Maasai word Siringit meaning 'endless plains', a just title for the world's most famous National Park. National Geographic Magazine describes the Serengeti as a "destination of a lifetime- the must-see spot for the complete traveller", one of the "last bastions of Eden". The Serengeti extends over some 5,700 sq. miles - roughly the size of Connecticut - supporting over four million mammals and birds and the greatest concentration of wildlife on the planet. The Serengeti has 4 distinct areas - the Seronera area (which is roughly in the middle) which has good resident game all year round, the southern open-grass plains around Ndutu and Moru Kopjes where the migration can be found from January through May, the western corridor along the Grumeti river, and the northern Serengeti which borders Kenya and where you can witness the wildebeest river crossings.It is perhaps the short grass plains and the Seronera area in the south and central areas of the Park that is perhaps best known to the first-time visitor. It is here that we find the kopje outcrops, the small granite rock formations that loom out of the seas of grass to form a distinct habitat for several species and a perfect viewing point for some of the big cats that populate these predator-rich plains. Equally scenic and with its own distinct ecosystem is the acacia savannah and wooded grasslands in the north of the Park, in the Lobo/Grumeti area where the Serengeti meets the Maasai Mara. It is in this region that the Migration begins to congregate for the push to the birthing plains of the South - the endless cycle of the wildebeest migration which makes the Serengeti one of the world's most unique wildlife adventures! Ngorongoro has an immediate and overwhelming initial impact, and like any great natural sculpture, grows in stature with familiarity. Designated as a World Heritage Site, the Ngorongoro Crater has one of the largest concentrations of wildlife in Africa. An estimated 25,000 large mammals make it, along with the Serengeti, the principal attraction on the northern Tanzanian safari circuit. This cross-section of wildlife is as diverse as you will find, dispersed amongst an amazing array of ecosystems within this natural amphitheater. It is home to one of the few remaining populations of black rhino in Tanzania and just about every other East African mammal (although leopard sightings are rare). Within the Ngorongoro Conservation Area, on the Naabi Plains that unfurl between the Crater and the Serengeti, lies Olduvai Gorge, popularly known as "The Cradle Of Mankind". It was here that Dr. Louis Leakey and his wife Mary first discovered the remains of Zinjanthropus Bosei, a distant ancestor of man believed to be 1.8 million years old and Australopithecus Bosei, the 'Nutcracker Man', a species that became extinct about 1 million years ago. There were also fossilized footprints, remains of ancient tools and bones from various prehistoric species which are now extinct. The Ngorongoro crater is just one part of the Ngorongoro Conservation Area which was formed in 1959 to safeguard the interests of the indigenous Maasai, who still retain the right to take their cattle down to drink at the lakes. Unique and diverse, the Ngorongoro Crater, although a "must see", is relatively small once inside and most people find that one full day or two separate descents is quite sufficient. It's size compared to the vast expanse of the Serengeti means that you will see many other vehicles, especially in peak season. The Ngorongoro highlands are also good for walking and there are many interesting Masaai villages to explore as well as a number of other extinct and active volcanoes like Olmoti, Empakaai and Ol Donyo Lengai to the north. Lake Manyara National Park is a small and verdant oasis of life in the confines of the East African Rift Valley. Lake Manyara, nestling at the foot of the Great Rift Valley escarpment, is a 125 sq. mile park of which two-thirds is covered by water. The name derives from "emanyara", the Maasai word for prickly euphorbia thorns. In addition to flamingos, the park is known for its large and boisterous hippo population, populous groups of baboons and several herds of elephant, whose tempers can be a little short as a result of the years of poaching that decimated their number. Another phenomenon distinct to Manyara is the occasional sighting of tree-climbing lions. The stunning Tarangire National Park offers picturesque views of Africa. Savannah grasslands, acacia stands, clusters of baobab trees, large herds of elephant and large tracts of rarely visited wilderness make this the epitome of the Tanzanian safari experience. The park is named after the Tarangire river that runs through the centre of the park providing the only permanent water source in the area. Tarangire is thus a dry season habitat (between July and November) because of the perennial water in the Tarangire river that attracts wildlife from much of the northern circuit ecosystems. By October, the park is full, the population swelled by mini-migrations of wildebeest and zebra that join the vast herds of elephant at the water holes. However, there is a permanent and sizeable resident population throughout the year, including all the predators (lion, leopard, cheetah, hyena and hunting dog), elephant and some mammals rarely seen in the other parks, such as lesser kudu and fringe-eared oryx. The Selous Game Reserve in Tanzania is the largest game reserve in Africa. This 45,000 sq. km reserve is home to Africa's largest populations of elephant, buffalo, hippo and crocodile, with some of the last remaining packs of wild dog, over 400 species of birds, and 2000 varieties of plants, shrubs and trees. The reserve is of such ecological diversity and importance that it was designated a World Heritage Site by the United Nations in 1982. The Selous remains unchanged from the days of the earliest colonial settlers. A true wilderness. To this day there are no permanent inhabitants to be found in this vast area comprising sandy rivers, tall grasslands and swathes of woodland. Named after the celebrated hunter turned conservationist, Frederick Courtney Selous, the Selous National Park still retains a sense of wild remoteness. The Selous is one of Africa's least frequented wildlife sanctuaries...a destination for the dedicated African wildlife enthusiast. Ruaha National Park is one of the most unspoilt and remote national parks in East Africa. It has an ecosystem as big as the Serengeti yet it has few foreign visitors in comparison. Established in 1910 and gazetted as a national park in 1964 the park is part of the Ruaha ecosystem which also includes the Rungwa-Kisigio Game Reserve to the north-west, totalling an area of 26,500 sq. kms. This vast area protects the catchment for both the Great Ruaha and Mzombe rivers. Ruaha is interesting, as it represents a transition zone where eastern and southern African species of fauna and flora overlap. The park forms the most southerly range where grants gazelle, lesser kudu and the striped hyena are to be found. Also to be seen are greater kudu, sable, eland and roan antelope - all more southern African species. Lion, leopard, cheetah and wild dog are all found here together with a number of smaller predators. Ruaha's 8,000 resident elephants remain the largest population in east Africa. Giraffe, zebra, impala and buffalo are all to be found along with a myriad of other species. Ruaha also boasts one of the last remaining strong holds for African wild dog. When people think of being on safari, most of them don't know how wild it can, and should feel. Some of them are lucky enough to find out - in Katavi. This is a unique Park where time has stood still - take this opportunity to see it at its most pristine. Katavi NP sits on a high, wide flood plain in remote south-western Tanzania, 40 miles south of Mpanda and about 200 miles north-west of Mbeya. The benefit of its remoteness is that, despite offering magnificent game viewing and a landscape of superb physical beauty, it has been barely visited, so it's completely un-spoilt, and totally undeveloped. It's as wild and natural as it was hundred's of years ago. The park's main features are the watery grass plains to the north, palm-fringed Lake Chala in the south-east, and the Katuma river. Tropical rivers drop down from the blue Mlele escarpment and snake into three huge golden grass plains, which are a Mecca for game. Borassus and hyphaenae palms occur along the many waterways, and light acacia and tamarind forest fringes the thicker miombo woodland. Lion, leopard, elephant, eland, impala, black-legged topi, zebra and vast herds of buffalo are to be found wandering the short grass plains. The Mahale Mountains rise on the far western border of Tanzania, some 90 miles south of Kigoma. Arusha is 540 miles to the north-east. This is absolutely the best place in the world for tourists to view wild chimpanzees, and staggeringly beautiful besides. The Mahale Mountains lie on Lake Tanganyika on the far Western border of Tanzania. The park is 1613 square kms, rising up from the lakeshore through tropical forest to 2462m (7500ft) at Nkungwe Peak. It is home to nine species of primate, including some 700-1000 chimps, forest antelopes, leopard and a great variety of birds and butterflies. There are no roads or cars for fifty miles. Getting there is by boat or on foot! In Gombe Styream National Park, on the shores of Lake Tanganyika, chimpanzees are more easily seen in their natural habitat than anywhere else in the world. In fact, Gombe was created to protect chimpanzees and was the region where Jane Goodall undertook her ground-breaking studies of chimpanzees in the wild. It is also renowned for its fantastic sunsets over Lake Tanganyika and its habitats include rain forests, grasslands, alpine bamboo and woodland. The best time to visit is between May and October. Zanzibar is an archipelago of tropical islands nestled in the Indian Ocean. The two principal islands, Zanzibar and Pemba, plus the 50 or so surrounding smaller islands, are known affectionately as the "Spice Islands", because of their history as producers of cloves and their position on the ancient spice routes. Behind the exotic name lies a violent and politically incorrect past. The island was once notorious as the slave and ivory trading capital of Africa. Repeatedly invaded by other cultures, including the Eqyptians, Chinese, Portugese, Arabs and British - all of whom left some cultural remnants - like the House of Wonders, the palace of the former Sultans. Zanzibar is an atmospheric place, full of contradictions and surprises - spice plantations, Arab houses, Anglican churches.... A place where famous African missionaries and explorers once passed through. Zanzibar's fascinating history and unique culture allows us to witness history in a modern world, offering tantalizing glimpses of a unique exoticism that makes this island seductive. Veiled women, white sailed dhows silhouetted against the sunset, and the ancient ruins of the Sultan's palace all convey a past exoticism of Arab, Swahili and Indian culture that defines Zanzibar as the Jewel of the Indian Ocean. A stroll down the narrow labyrinthine streets of Stone Town takes you back 150 years to when Zanzibar was the trading center of East Africa. One might catch a glimpse of the ornate latticework on a balcony, the intricacy of sun-warmed wood on a carved door, or the tumbling roofs of the spire of the Anglican Cathedral. Zanzibar is steeped in a history that few people consider when they think about East Africa. Fly-in safaris are available throughout Tanzania, although it is best to concentrate on one region at a time (this is trully one very BIG country). Charter flights get you to your destination quickly and give you an opportunity to see the lay of the land from the air. A private vehicle with driver/guide is a great option for small groups and families (and honeymooners too)! With good roads (mostly) and reasonable distances between parks, the northern circuit is ideal for hiring your own private vehicle + driver/guide. Go at your own pace and reap the rewards of having the same knowledgable guide throughout your stay. A range of mobile safaris are offered, mostly on the northern circuit, to cater from mid-budget to luxury travellers (with prices varying accordingly!). At the luxury end these generally utilise seasonal camps established for 2 to 3 months at a time but still along the lines of a true bush camp with no electricity or permanent plumbing etc. With the prominence of the private vehicle + driver/guide style of safari (especially in northern Tanzania) this can lend itself well to families, offering maximum flexibility and the opportunity for the family to share their safari experience on a more exclusive basis. Although no horse riding safaris are offered in Tanzania there are a limited number of locations near lake Manyara, near Mt Kilimanjaro, in the Grumeti Reserves, and along the Swahili Coast where we can arrange horse riding activities from a lodge. Walking is now offered as an activity at a number of safari camps and lodges, although it must be said that Tanzabia is still new to walking safaris. Ask us for our recommendations. 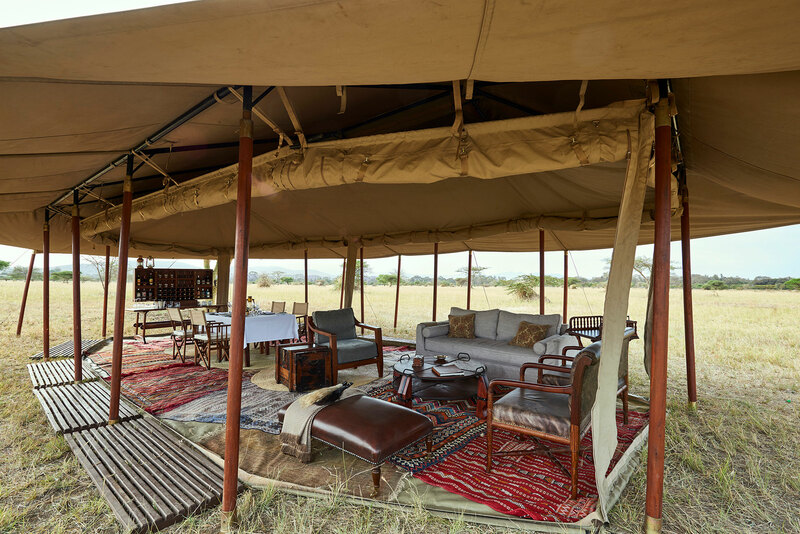 In both Tarangire and Selous (and more recently Ruaha) it is possible to explore deeper into these reserves and take the opportunity to spend a night or two away from your lodge, walking during the day and spending the nights camped in the bush along your route. Accommodation is in mosquito-net enclosed tents that offer protection but offer an uninterrupted panoramic view of the night sky from your soft linen pillow. Each camping spot is specially chosen for its view or the game in the area and allows you to utterly absorb yourself in the wilderness. Each fly camp is fully managed by a team of staff. Walking into your camp site as the sun is setting, a fully stocked bar will have been set up with cold drinks and ice. After a steaming bush shower set up under a discrete tree, you will be served a three course dinner set at a table laid under the stars, before heading off to bed, lulled by the gentle grunts of hippo in the lake nearby. Mount Kilimanjaro is on many people list of challenging feats (the world's tallest free-standing mountain) and offers excellent hiking should you be seeking a more active adventure. Experiencing a balloon safari across the Serengeti plains is an adventure of a lifetime. These operate from Seronera and Grumeti and guests will need to overnight at a lodge in either region prior to the balloon flight. After rising at dawn, guests are transported to the balloon launch site where tea and coffee are served as the crew fires up the burners and inflate the balloons ready for take-off. 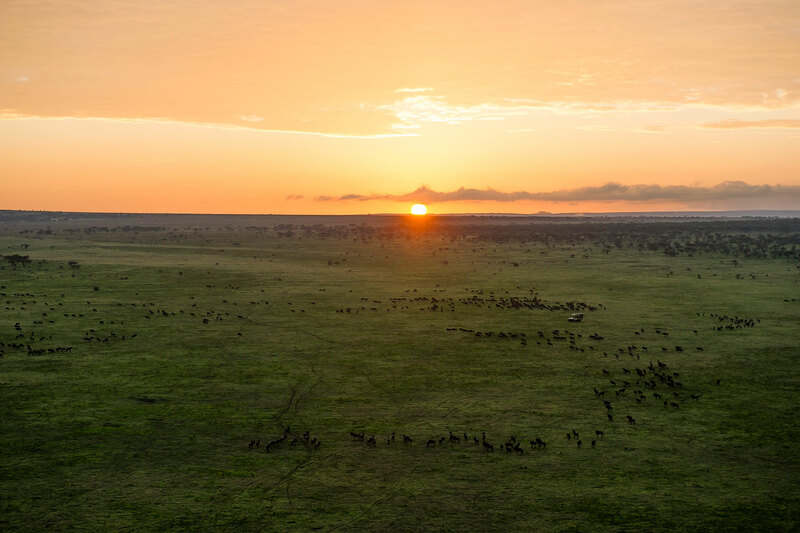 As the first rays of sunlight flicker across the sky, the balloons take off across the vast Serengeti plains and guests get their first sight of the early morning animal activity taking place on the ground below. For approximately an hour the balloons glide through the sky in whatever direction the air currents dictate and upon returning to earth (sometimes the most exhilarating part of the adventure), a champagne breakfast is served. Once breakfast is finished, a leisurely game drive back to the lodge completes the experience. Price guide: US$450 per person. Arusha is the tourist hub for the northern safari circuit (Tarangire, Lake Manyara, Ngorongoro, Serengeti) and serviced by Kilimanjaro International Airport (KIA) nearby whilst Dar es Salaam is the gateway to the southern circuit (Ruaha, Selous, Mikumi) with scheduled flights into the Selous, Ruaha and Katavi (although flights are also available from Arusha). Whilst the northern circuit can be a fly-in circuit, it is more generally accessed from Arusha by road (using a private vehicle plus driver/guide). Conversely, the southern circuit is serviced by a regular scheduled fly-in routing although it is possible to do this by road (but with fairly long distances needed to be covered). Most itineraries itineraries in the north start with an overnight in Arusha with a number of excellent accommodation options of varying styles and budgets. An overnight in Dar es Salaam, where necessary, generally involves a busier airport transfer and the selection of a city hotel. The domestic and international terminals are also separate (worth noting). Dar es Salaam is also an important hub for its proximity to Zanzibar and the coastal resorts south of the city. Arusha National Park is a little gem that includes a rich tapestry of habitats with 3 distinct zones that contribute to its variety and beauty: the lush swamps of Ngurdoto Crater; the tranquil beauty of the Momela Lakes, each a different hue; and the chill rocky alpine heights of Mount Meru rising to 4,566 metres (14,990 feet). The park is also reputed to have the highest density of giraffe on earth. Momella Lakes are a cluster of shallow alkaline lakes to the East of the park, which attract seasonal flocks of flamingo and migrant birds. Ngurdoto Crater is a small 4 sq. miles crater with a constant resident wildlife within its walls. The crater is inaccessible by vehicle but several viewpoints dotted around the forest-fringed rim afford good views of the congregated wildlife within as well as sweeping vistas of Mt. Kilimanjaro. The highland forest around the crater as well as the slopes of Mt. Meru harbour the rare Black and White Colobus monkey. Mt. Meru is the second highest peak in Tanzania, shadowed by Kilimanjaro, its more celebrated cousin across the Maasai Steppe. Meru's size once surpassed Kilimanjaro's until a lava explosion blew out the eastern face. The diverse geology of the area is reflected in the breathtaking view of the ash cone and 4,500 ft. cliff face leading to the summit. The climb to the Meru summit takes the visitor through vegetational changes through forest aflame with red hot pokers, dripping Spanish moss, carpeted with clover rising to open heath, spiked with giant lobelias to moorland which helps support the various fascinating wildlife and flora. Everlasting flowers cling to the alpine desert, as delicately hooved klipspringers mark their progress. The reward from the summit is the unparalleled views of the majestic Mt. Kilimanjaro and the East African Rift Valley. Astride the craggy summit, Kili stands before you, breathtaking, blushing in the sunrise. Tanzania combines well with Kenya, Uganda and Rwanda. In the north, the heavy rains fall in April/May, and the light rains fall in November. This said, both April and May are wonderful times to visit Ngorongoro and the Serengeti - less crowded, green and with the migration in full swing! The road from Arusha to the Ngorongoro Conservation Area entry gate is now fully tarred (sealed). However, the road from the crater down to the Serengeti is still gravel but is short and in reasonable conditions at most times of the year. It is an idea to build into your itinerary a charter flight on the return leg, should the budget permit. The wildebeest migration is best viewed in the Serengeti from Jan-October as it moves from the south, west and finally north. Due to it's altitude, nights on the Ngorongoro crater rim can be cold - be prepared. There is a Treetop Walkway in Lake Manyara NP - this 370m walkway offers a unique perspective of the forest surrounding the entry gate to tghe Park, rising from ground level up through the canopy where you reach a height of 18m off the ground. Each of the 10 supension bridges end on a viewing deck situated around tree trunks. The treetop platforms are perfect places to stop and enjoy life in the canopy amongst the butterflies, monkeys and birds. Tarangire is at its best during its dry season from July to September. Southern Tanzania is best visited between May and Nov. Weight restrictions apply to scheduled flights within Tanzania - generally 15 to 20kgs ONLY. Mobile safaris are generally 7, 10 or 14 days and generally to start and end in Arusha. Photographing of people (the attractive and distinctive Maasai people are obvious favourites for visitors), can be a sensitive issue and usually requires permission and payment. It is inadvisable to randomly try and take photographs of people along the roadside as many people now use it as an income and can get fairly upset and unpleasant if a deal isn't negotiated. With so many incredible safari destinations within Tanzania it is seldom necessary to venture any further afield - and, with Zanzibar off the coast your down-time is taken care of.